We recently visited the Oak Point Area, at Turkey Swamp Park in Freehold NJ. Turkey Swamp Park is a beautiful Monmouth County Park that is over 2,000 acres. Only had time to visit a small section in Oak Point. Thanks to Karin L. for sending this roving reporter review! For this report Karin has earned 2 free passes to Imagine That!!! in Florham Park. Check out this link for more information on how you can earn passes too! Another guest post by Sara Rall! 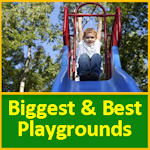 McCoy Park, at the northeast end of 4th St just off N. Washington Ave. in Dunellen (Middlesex Co.) is a brand new moderate-sized playground at the local Little League fields. Thanks to Michelle for our newest roving reporter submission that is in West Paterson, or now currently known as Woodland Park. Thanks to this new promotion with Imagine That!!! 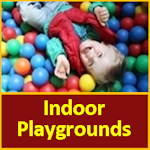 we are getting alot more favorites from our NJ Playground Facebook fans!